A lacklustre Leighton Town were sent crashing out of the FA Trophy on Saturday as they were brushed aside by Enfield Town. 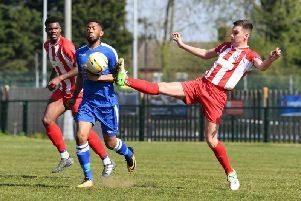 The 4-0 scoreline, with two goals in each half, wasn’t much of a surprised given Enfield’s start to the season - flying high in the Ryman Premier Division - but Leighton’s performance will leave something of a sour taste in the mouth. And perhaps more of a concern for Mark Eaton is the side’s lack of goals, having scored just three times in their last seven outings. Leighton though had a great opportunity to open the scoring after barely a minute on the clock against Enfield when Ben Gallant broke down the left and sent a low ball across the face of goal but Russell Bull at the far post could not get a touch and the ball was cleared by the home defence. Enfield’s first chance came just three minutes later when first Mickey Parcell forced a save from Aaron Bufton, and then skipper Ryan Doyle headed wide. They weren’t to be denied in the seventh minute though when Bobby Devyne latched onto a through ball to roll his side into the lead. He came close to doubling the score two minutes later when he was sent tumbling in the penalty area - a challenge the referee deemed fair though, letting Leighton off the hook. Just after the half hour, Corey Whiteley had two chances for the home side, shooting just wide with the first and then cutting in from the left he curled a curling shot fractionally over the crossbar. He did not have to wait long to get amongst the goals however and in the 36th minute he drove home from 10 yards after Scott Durojaiye had easily opened up the Leighton defence before pulling the ball back for the striker to double the lead. Enfield went further ahead in the 57th minute when Dernell Wynter cut inside from the left wing before driving a low shot between Bufton and his right hand post. Leighton had some more bad luck when Drew Mitten, who had just come on as a substitute suffered a serious foot injury when crossing the ball from the left wing, and he was replaced by Kerran Birch. Enfield completed the scoring in the 64th minute when Whiteley scored his second of the match after rounding Bufton to score a simple goal and put the result well and truly beyond doubt. Leighton kept up the search for a consolation goal though, but had to wait until the 77th minute before getting their first shot on target. Birch cut in from the left and fired a right footed effort on target but David Hughes in the home goal made a reasonably comfortable catch. Birch was involved again a minute later when he got a touch to a low cross but a defender deflected the ball for a corner which Alex Woodfine touched wide. The hosts nearly added a fifth in the 91st minute when Harry Ottaway struck a fierce shot that struck the angle of the bar and post before bouncing across goal. Town can have no complaints about the score after a disappointing display and they now have to pick themselves up for a vitally important game at North Greenford next Saturday against another side who like Town are struggling near the foot of the table, but had a good win recently against Chalfont.